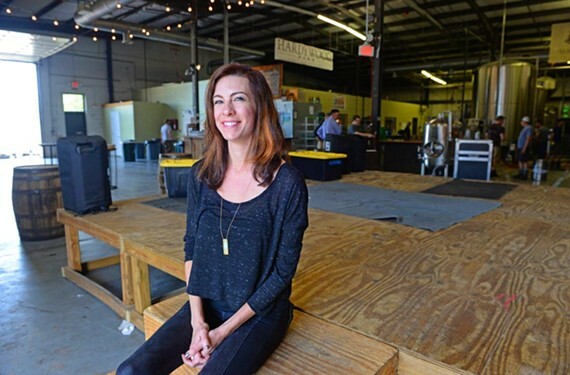 Kerry Anderson has been making a name for Hardywood Park Craft Brewery as a favorite spot for local bands to play — good sound and those complimentary beers don’t hurt either. Don’t look now but Hardywood Park Craft Brewery has this music thing down. What started mostly as special events has moved to three regular local concerts a week, usually on weekends. Booker Kerry Anderson, 33, came to work for the brewery in 2012 after her former employer, Six Burner restaurant, closed. She’s since booked hundreds of local bands in the space — both inside and outside of the brewery. In the past year she collaborated with locals as diverse as Andrew Blossom and his surreal “Twin Peaks” festival and singer Tony Foresta, who brought Pig Destroyer and his own band, Iron Reagan, to the stage -- not to mention local live favorites from Bio Ritmo to one of Anderson's favorite bands, RPG. During our research for Style’s annual Music Issue, a number of musicians mentioned how much they loved playing shows there, mostly because they always got their guarantee money with the added bonus of plenty of free beer for each musician. Anderson also points to the strong PA system and the brewery’s ability to help promote the shows.